THIS month our cover depicts a maneuver used many times during the latter months of the war, but not greatly exploited in story or illustration. It is not known who originated the decoy idea, but a defense for it was perfected by the British. The painting shows two unusual ships, a German L.V.G. scout and the British Austin “Greyhound” two-seater fighter. 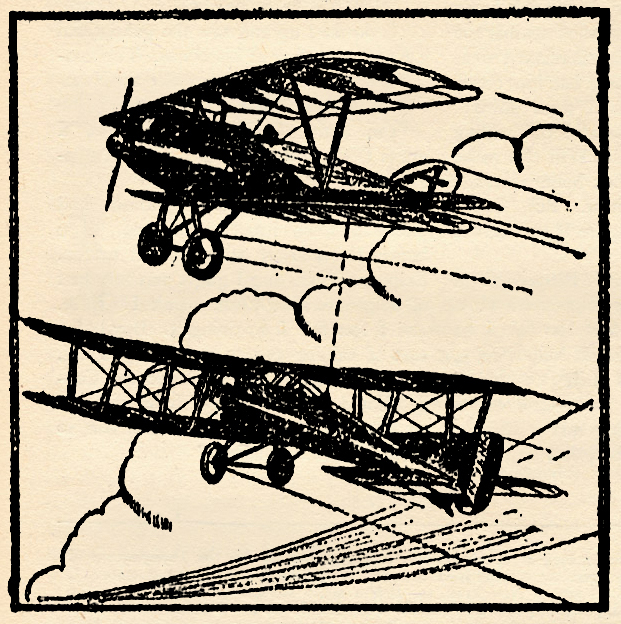 It is improbable that either of these ships ever reached the Front and saw squadron service, but it is known that two or three were sent out and tried by the service-test pilots, whose duties were to flight-test new machines in actual combat, after they had been passed on construction, maneuverability and performance. The faults that lie hidden while ships are undergoing tests over friendly soil are usually brought out in the heat and flame of aerial warfare. So, in order to give you new models to study, we show the British Austin “Greyhound” getting the D-type L.V.G. scout. We know of no better way of giving you accurate detail pictures, and at the same time explaining some of the intricate maneuvers used on the battlefront. In this case, we have the original move of the German Staffel commander in sending down the unfortunate decoy. This ship was usually flown by a smart pilot who not only knew how to fake a “greenie” in the air, but was expected to be able to entice the Allied ships down and keep them occupied until the Staffel above could get down and come to his “rescue.” He not only had to be a game pilot, but he had to know every trick in the game. It was necessary that he know every inch of his Front, too, so that if his ship was damaged and he had to make a forced landing, he could cut into the bend in the line and be certain he was well inside his own territory. This time, the British two-seater leader spots the move. It is possible that the lurking German scouts above have not made full use of the sun, or else they have been spotted as they tore through a hole in their cloud hideout. At any rate, the British commander gives his sub-leader a signal, and the pilot fires a red light, indicating that he is having engine trouble and wants to go back. 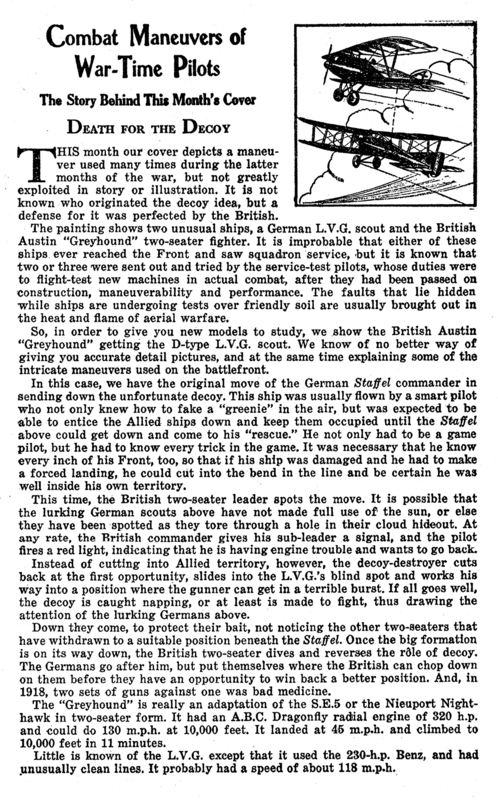 Instead of cutting into Allied territory, however, the decoy-destroyer cuts back at the first opportunity, slides into the L.V.G.’s blind spot and works his way into a position where the gunner can get in a terrible burst. If all goes well, the decoy is caught napping, or at least is made to fight, thus drawing the attention of the lurking Germans above. Down they come, to protect their bait, not noticing the other two-seaters that have withdrawn to a suitable position beneath the Staffel. Once the big formation is on its way down, the British two-seater dives and reverses the role of decoy. The Germans go after him, but put themselves where the British can chop down on them before they have an opportunity to win back a better position. And, in 1918, two sets of guns against one was bad medicine. 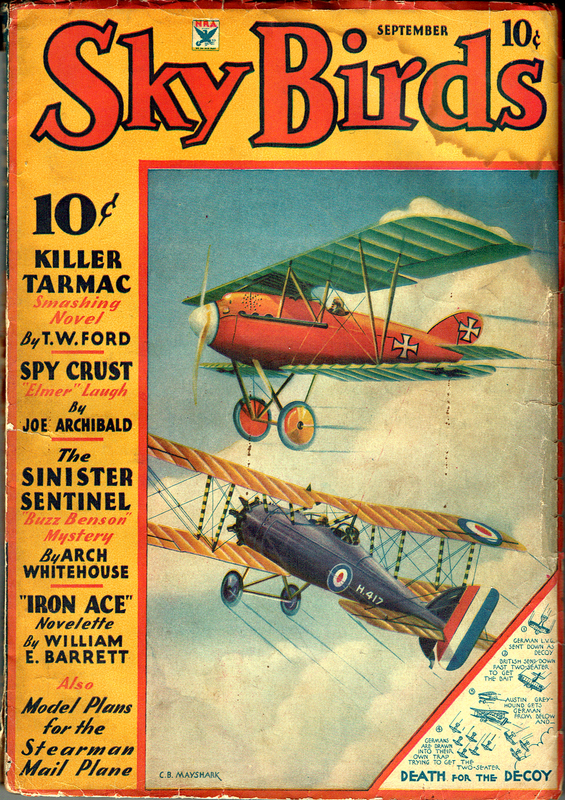 The “Greyhound” is really an adaptation of the S.E.5 or the Nieuport Night-hawk in two-seater form. It had an A.B.C. Dragonfly radial engine of 320 h.p. and could do 130 m.p.h. at 10,000 feet. It landed at 45 m.p.h. and climbed to 10,000 feet in 11 minutes. Little is known of the L.V.G. except that it used the 230-h.p. Benz, and had unusually clean lines. It probably had a speed of about 118 m.p.h.